For Immediate Release: Posted On 2/11/2016 By Industrial Magnetics, Inc. The Mag-Mate® group of Industrial Magnetics, Inc. recently introduced a new line of inspection mirrors, called HiVis Orange, into their line of hand tools. 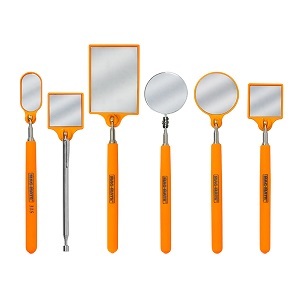 The mirrors’ bright orange handle color is aimed at making them easy to spot, thereby minimizing the chance of leaving them behind in crowded work areas. The HiVis Orange line is especially suited for use in FOD(foreign object debris) control areas, such as engine maintenance, where forgotten tools could cause major equipment damage and hazardous conditions. The HiVis inspection mirrors are available in several different configurations of mirror styles, as well as length of telescoping reach, in order to meet application needs. Mirror choices include glass, stainless steel or acrylic. Most handles are composed of a nonslip, solvent-resistant, cushion grip, except for one stainless steel model which contains a magnetic retriever. The telescoping length of each unit ranges from 26” – 37” for expanded reach capability.